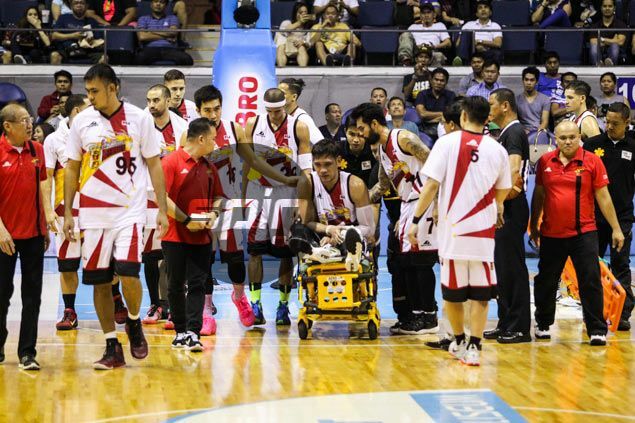 JUNE Mar Fajardo twisted his left knee and was carried out in a stretcher midway through Game Six of the Smart Bro-PBA Philippine Cup semifinal series between San Miguel and Rain or Shine on Friday. Fajardo crumpled to the floor after apparently hyperextending his left knee when Jireh Ibanes tried to box him out during a rebound play with eight minutes left in the third period and the Beermen trailing, 47-52. Chants of 'MVP, MVP' rang out from the Smart Araneta Coliseum stands as Fajardo was wheeled out in a stretcher, concern etched in the faces of SMB players, coaches and officials as well as the fans. The leading candidate for the Best Player of the Conference award, the 6-10 slotman, who is logging close to 40 minutes a game in the series, is also expected to play a big role in Gilas Pilipinas' campaign in the Olympic qualifying tournament in July. The Cebuano big man, who has suffered a major knee injury during his rookie year in college in the Cesafi, later told San Miguel Corp. sports director Alfrancis Chua that his knee seemed to have locked up when he went down with the injury. The back-to-back league MVP had his knee wrapped in ice and was administered with a pain killer but was still in obvious pain as he was brought out of the court. “Sino ang lamang,” he asked those around him – including girlfriend Aeriel Patnongon - while being treated inside the San Miguel dugout. The San Miguel big man never returned to the game and was brought to St. Lukes hospital for further check up, with officials keeping their fingers crossed it won't be an ACL or any major injury. San Miguel staffer Jules Laurente said Fajardo is scheduled to go MRI test also on Friday night. "Hopefully, it's not serious," he said. "Ang medyo maganda nababaluktot niya (yung tuhod). Kaya sana nga, di ganoon kagrabe."